5 Field Service Marketing Tips You Can Add to Your Business Today! This spring, we had the opportunity to chat with Pat and Emily from DogWatch of Columbus at the Annual DogWatch Dealer Meeting. One thing that stood out to us in our conversations with them is how much they embrace change. Whether it’s adopting tech to manage their operations, embracing changes in customer service best practices or marketing, they’ve seen a lot of changes in their more than 25 years in business—and they don’t shy away from it! Of course, one of the big changes we’ve seen in the last 25 years is the arrival of the Internet. This meant a move from offline marketing to online marketing in a “post yellow pages world” says Emily. Pat and Emily are passionate about helping other businesses and have shared some of their learnings and top marketing tips for service companies with us. 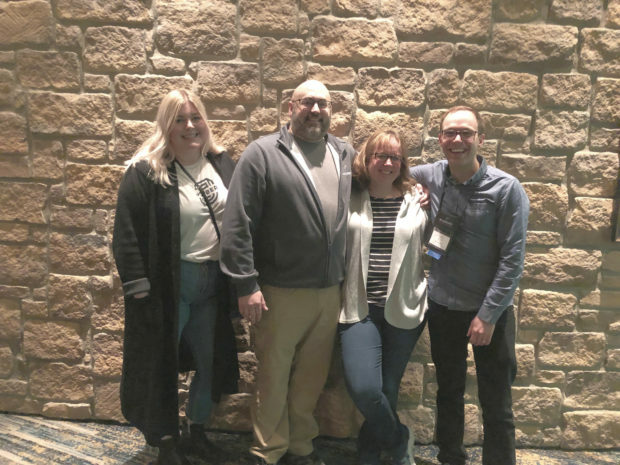 Rebecca (Jobber), Pat and Emily (DogWatch), and Paul (Jobber) at the 2019 DogWatch Dealer meeting. Let’s use building your social media presence as an example. When you get started, you won’t have many followers or get much engagement, but when you start with a good foundation, you’ll see results later on. Once you’ve built a social media presence, it’s important to regularly engage with your audience and followers. Remember: you want to engage and talk with your audience and not just talk at them. “You’re better off mixing up your posts with fun posts that don’t focus just on selling—even a silly meme or a customer quote” Emily shares. By doing this you’ll be building a brand that your customers can relate to, build repeat business, and keep you top of mind when it comes time for a referral. Looking for some inspiration on where to get started with your posts? Check out our resource that will take you through a month worth of Facebook post ideas for your field service business. If you do a quick Google search for DogWatch of Columbus you’ll see their great reviews on Google and Facebook. But they take their reviews to the next level by having unbiased and unedited reviews right on their website. DogWatch of Columbus showcases unedited reviews on their website. “People are skeptical of true marketing,” Emily shares, but online reviews give small businesses an authentic way to promote their business. To get great reviews, Pat and Emily simply ask for a review when they know they’ve got a happy customer. But reviews aren’t the only place where your customers can be your advocates. 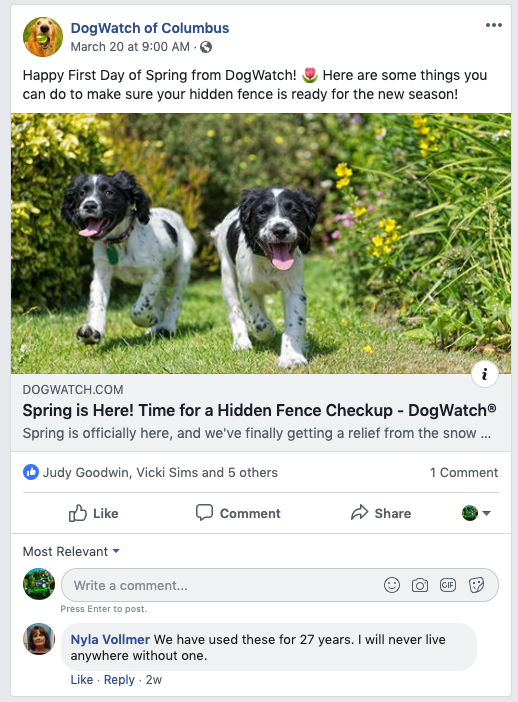 Because DogWatch of Columbus has built up a great social media presence, they’re seeing their customers contribute to their posts on social media. In addition to brand building activities like building a social media presence and building up your online reviews, you can always look at paid advertising. One of the great things about paid advertising, including pay per click advertising like Google Ads, is that you can pay to get traffic to your website before you have an established brand. Keep in mind that just because you’re paying to bring people to your website, it doesn’t mean they’ll become a paying customer. To track your marketing efforts it’s helpful to use a CRM like Jobber. In Jobber, you can use custom fields to track your lead sources and marketing efforts. Learn more about using custom fields here. Pat and Emily are both life-long learners, and you have to be if you’re going to be successful in business for more than 2 decades. So where did they go to learn about everything digital marketing? Looking to grow your online presence? Find out how to get found on Google.